Saturn Sands | Life on the Mojave: Biological Soil Crusts - NOT BORING, seriously! Last week Ken and I took a class on Biological Soil Crusts (BSC) from The Desert Institute at Joshua Tree National Park. I’m a big fan of Paul Stamets and his work with funghi and mushrooms. I am fascinated with the giant Armillaria ostoyae, the largest organism on Earth, that occupies 2,384 acres in Oregon’s Blue Mountains. I’m fascinated with mycorrhizal and mycelial networks that act as a sort of Internet for plants. I thought these kinds of plant wonders were confined to lands with ample moisture and despaired that anything as cool as this could exist in the Mojave Desert. Until now. It started when we were looking at a property out on the far edge of nowhere. The land was largely undisturbed and I noticed when I walked across it the surface sand collapsed in a tiny crunch that I didn’t notice on disturbed land. Later, when we had our own place I noticed this would happen after a rain. 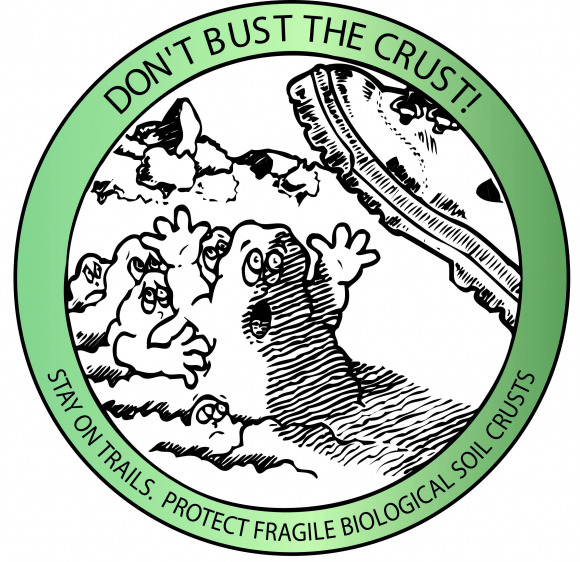 Talking with locals I learned about soil crusts and campaigns to “Don’t bust the crust.” I learned about the class at the Desert Institute. When I told the instructor of my experience she seemed unconvinced that this was the beginning of a biological soil crust. She told me it was more likely that the water from the rain displaced the air in the soil, which rose up to the surface, lifting the sand. That is a pretty cool explanation, but it deflated my hopes for biological networks in our soil. To confirm that you have the beginning of a biological soil crust, you must be able to lift a chunk of soil with knife or spatula and see little “danglies”, which would consist of soil held together with bacteria and/or fungus. See the "danglie," top right. 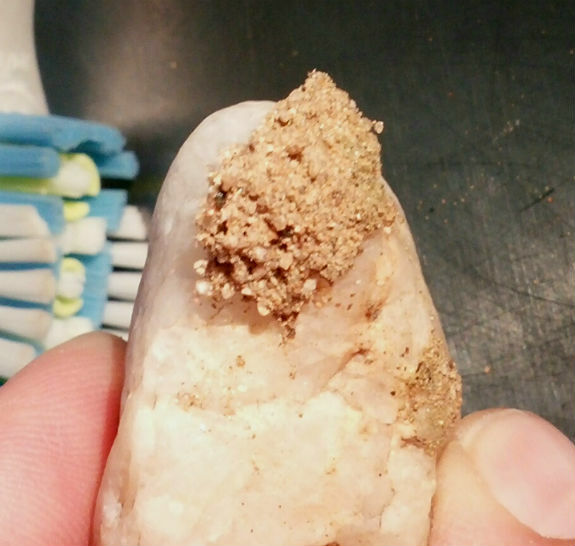 Yesterday I picked up a rock from the desert floor on our property and a chunk of sand stuck to it. I turned it and could see danglies, though they were very small and I had no idea what size danglies should be. I took it inside, shined a light on it and could see very easily that pieces of soil were hanging from the soil mass. If this is biological soil crust, and I believe it is, then the soil is held together with cyanobacteria, or blue green algae, which lies dormant until activated by rain. At that point it swells and sends filaments through the soil, creating an environment conducive for other microflora (mosses and lichens) and later, plants. Soil crusts form at a microscopic level and are hella delicate so it is critical to avoid busting them by tramping through the desert or rolling through on ORVs. Biological soil crusts bind the soil and so help prevent erosion and dust. They also fix nitrogen and carbon which may ameliorate climate change. So if you must walk across the desert, stick to roads, trails or washes. If you must cross, please return in your own footsteps. Happy trails.